August 2015 - Deb Arnold, Ink. Sometimes I just want to share useful information I’ve come across. And this fits the bill. 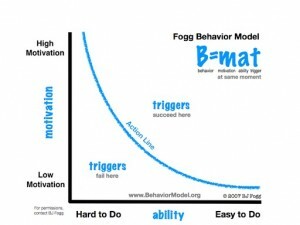 The Fogg Behavior Model shows that three elements must converge simultaneously to cause behavior change: Motivation, Ability, and Trigger. No behavior change? At least one of the three is missing. The model was developed by Dr. BJ Fogg, who founded the Persuasive Tech Lab at Stanford University. He studies and develops innovations focused on using technology to change behaviors in positive ways. Have you ever used his model? If not, how might you apply this thinking to your work?